Situated amongst cypress and Mediterranean pine trees, the ruins of the part of ancient Rome reveal more than any other monument in the capital, what everyday life must have been like i ancient times. Leaving Rome and following the road leading to the sea, Via del Mare, it takes about 30 minutes to reach Ostia, the Roman city of Imperial age whose Latin name ‘Ostium’ means ‘mouth of the river’, reflecting its position along the Tiber river. Ostia was founded around the 4th century BC by King Anco Marzio and became the harbour of Rome around which, throughout following centuries, a flourishing trade and business centre developed. Following the Barbarian invasions, the decline of Ostia began when the post was abandoned and became silted up. The archeological excavations undertaken at the beginning of the XIX century have brought the ancient city back to light, a rare witness to 900 years of Roman civilization. During your walk through the ruins, your guide will tell you something about the cultural and social life of this interesting commercial settlement. 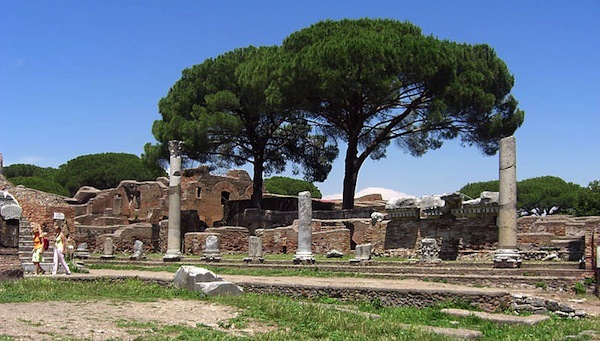 Your visit to Ostia Antica itself starts at ‘Via delle Tombe’ of the ‘Decumanus Maximus’, the main thoroughfare that crosses the city from north east to south west. Then you will arrive at the ‘Terme di Nettuno’ where you can admire the beautiful black and white mosaics representing Neptune and Amphitrite, the theatre built by Agrippa and the Forum which formed the centre of the city. Here you will discover the principle public buildings, ‘Il Capitolium’ and the temple of Rome and Augustus, the Basilica and the large thermal baths. Near the forum square you will also find the House of Diana and the ‘Thermopolium’ an ancient Roman bar with a marble counter and a fresco depicting the fruit and foodstuffs that were sold there. At the end of Via dei Dipinti, the Museo Ostiense displays some of the ancient sculptures and mosaics found among the ruins. Runs: Every Friday and Sunday Morning.